I Am Nigerian. I Am American. I Will Not Choose. A.C.T. Master of Fine Arts Program alum Mfoniso Udofia is taking the American theater by storm. Her current project is the Ufot Family cycle, a series of nine plays exploring a family of Nigerian immigrants in America. 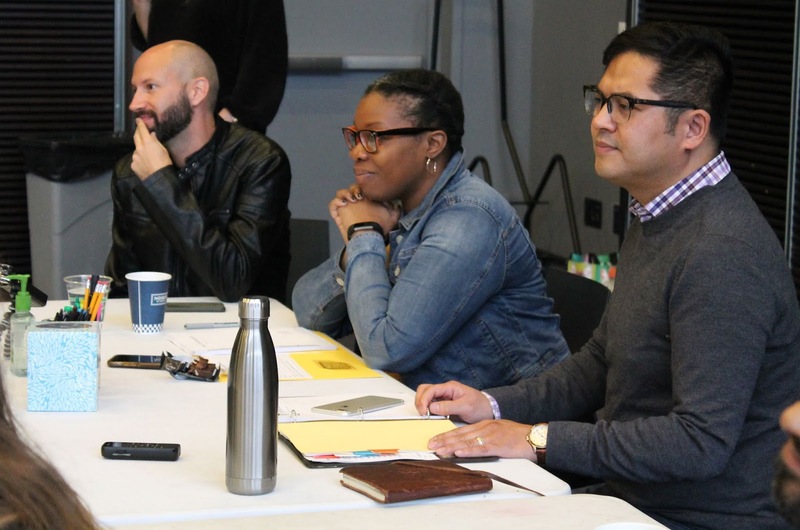 The cycle has been workshopped at leading new-play incubators, including SPACE on Ryder Farm and Dr. Barbara Ann Teer’s National Black Theatre. Three of the plays—Sojourners, runboyrun, and Her Portmanteau—have been produced at The Playwrights Realm, Magic Theatre, and New York Theatre Workshop. Now, she is back at A.C.T. with Her Portmanteau. After 22 years apart, Nigerian-born Iniabasi Ekpeyong—bearing a worn portmanteau—reunites with her mother and half-sister in Manhattan. This coming together isn’t easy. The women must sort through their literal and figurative baggage as they uncover their personal and familial identities. We chatted with Udofia about the Nigerian American identity and the importance of having Black bodies onstage. Scenic designer David Reynoso, playwright Mfoniso Udofia, and director Victor Malana Maog at the first rehearsal for Her Portmanteau. Photo by Elspeth Sweatman. A big theme in Her Portmanteau is identity. It’s a tricky place to live, caught between multiple cultures, languages, and countries. It is. Especially when the country you are from becomes more and more unlike the country you’re now in. The United States is a very individualistic society. Nigeria is more collectivist. Being a Nigerian in America, it’s always a fight between the “I”—“I want to succeed”—and the “we”: “This is what we have always done. This is what we need to do.” There’s always a struggle within second-generation offspring; I can look at my foreign-born parents and their culture that is also a part of me and understand it, but also look at American culture and ethos and understand that. As a playwright, I want to illuminate that intersection, because I actually live it. I am Nigerian and I am American and I will not choose. The more we see stories where we are living in this intersection, the easier it will be for those of us who live there. How does your work tackle the misconception that all Africans are from impoverished war-torn areas? Africans from those areas exist, and the plays that chronicle their lives can be illuminating and impactful. But if those representations become the only truths you see related to an African body, that’s problematic. The Africa that I know, and the Nigeria that I know, do not look like that. Did we have a cataclysmic, terrifying war? Yes. The first modern, African civil war—the Biafran War—happened in my ancestral homeland. But do we also barbecue at our house in Massachusetts? Yeah. It’s important to me that audiences see different kinds of Blackness in relation to each other. In TV shows or plays, you see only Nigerians in Nigerian stories, only African Americans in African American stories, Jamaicans in Jamaican stories; you never see us all interacting. My Ufot cycle wants to look at what happens when Africa and the African Diaspora do interact, and interact from a place of love. Her Portmanteau—Udofia’s fourth installment in her Ufot Cycle—begins previews at A.C.T.’s Strand Theater February 15. Get your tickets here. And to read the full interview with Udofia, purchase a copy of Words on Plays, A.C.T.’s in-depth guide to mainstage productions.